I will be the first person to tell you that I hate comfort food. Believe it. I can't stand beef and noodles, chicken and noodles, pot pies, pot roast, or anything covered in gravy. It isn't a health thing either, I'm just not a fan of big heavy meals. When Ingrid and I went to IKEA last month I was past hungry, into shaky territory and decided (without really thinking) to go with the Swedish Meatballs meal. And it was amazing. This is the actual photo of my meal. On Tuesday I got really hungry for it again. It is so odd because never in my life have I ever wanted a meal like this. I'd eat it if it were around, but would never go out of my way to make it. Josh didn't want it on Tuesday, I didn't want to go to the store on Wednesday, so we had it tonight. I got to use my gravy boat for the first time ever. Hopefully not the last. I picked up this jar of lingonberry preserves while we were at IKEA. Next time I have to buy more than this one little jar. Josh likes it on his toast. Gravy, lingonberry preserves, and mashed potatoes. 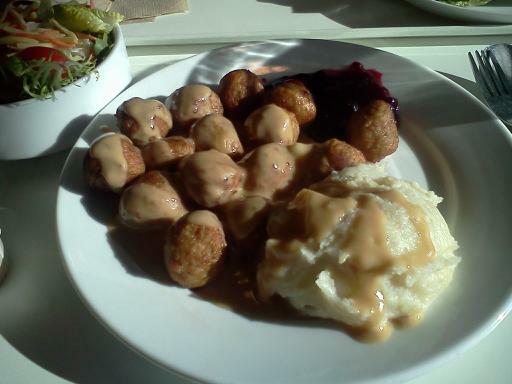 Only real difference is that my gravy wasn't as thick as IKEA's gravy, but this meal was still delicious. Now, get ready to flip out all you Foodies. I used frozen meatballs, packaged mashed potatoes, and powdered gravy. This meal took 18 minutes to make, and would have taken less if I had made the meatballs in the microwave. We're talking 10 minutes start to finish people. I'm a firm believer that the amount of time you spend on a meal does not dictate the deliciousness of said meal. If you can make a fantastic meal in less than 20 minutes, who cares? I'm like that Semi-Homemade lady, but didn't get drunk while I was cooking. Are These Dark Circles Forever?